Once completing the steps above, follow the instructions below (starting from the 'Confirm Recipients' step of the Send Message process) to send an SMS message. 2. The 'Compose Message' screen will open. Type the message to be sent to recipients into the Message field. There is a 140 character limit for SMS messages. As you type, the 'counter' below the message field will show the number of characters you have remaining. 3. 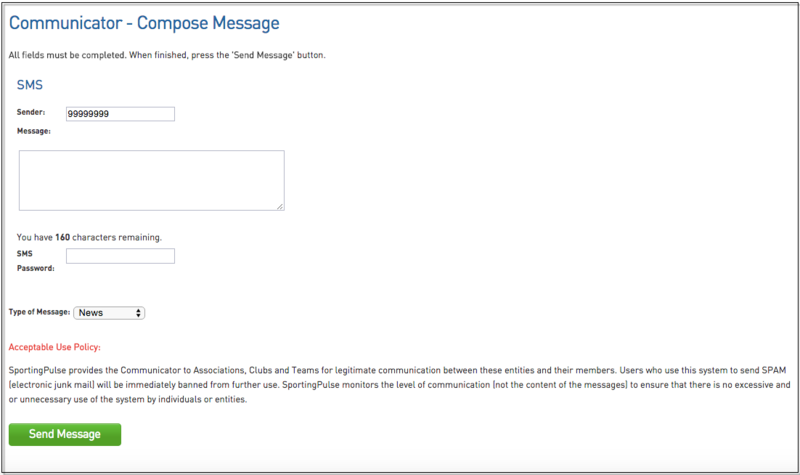 Enter your association/ club/ team's SMS Password in the SMS Password field. 4. Read the Acceptable Use Policy. 5. When ready to send, click on Send Message. 6. A message will appear confirming that the SMS message has been sent and the number of recipients it has been sent to. Important: SMS credits are not refundable. Click here to read the SportsTG SMS Terms and Conditions.